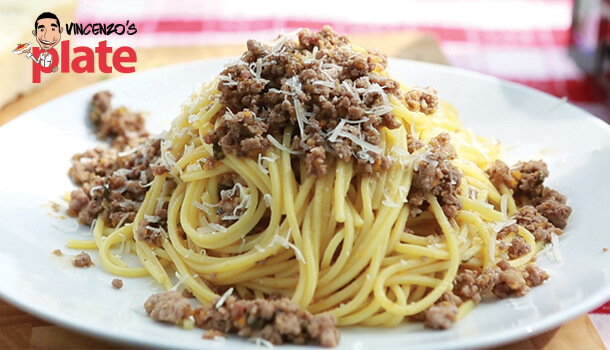 Spaghetti Bolognese is one of the most classic dishes which originated in the region of Emilia Romagna. 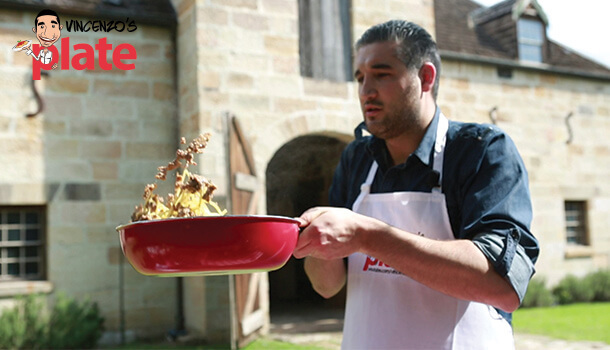 It is made up of bold veal and pork mince sauce which simmers for hours in sweet tomato paste and best served with egg pasta cooked al dente. It really is, the taste of Italy. Simply YUM. 1. Break off the celery leaves and put them aside. 2. 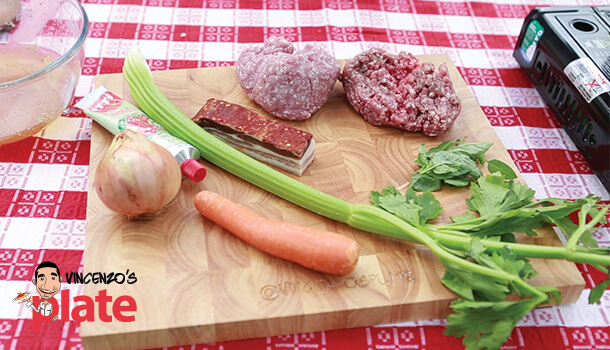 In preparation for the spaghetti Bolognese, cut up the carrot, celery, onion and pancetta and mix it together in the food processer. 3. Put the saucepan on the stove at a medium heat and add some extra virgin olive oil. 4. Add the mixture that you just made from the food processor and stir well. Cook this for 5 minutes until it becomes nice and golden. 5. 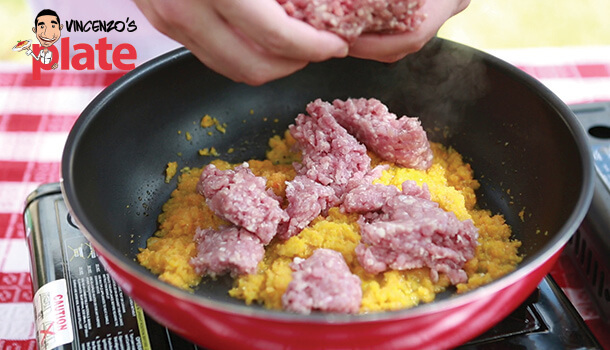 Add in both types of mince and stir well. 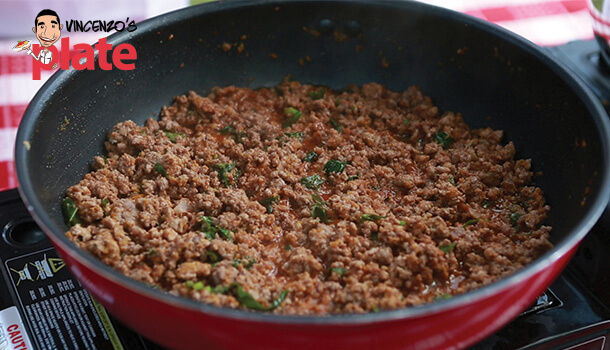 Break the mince down using a wooden spoon and blend it in well with the other ingredients. 6. Add salt, pepper and oregano and mix it through as well. 7. When 80% of the mince has turned brown, add 200ml the red wine and cook it until it evaporates. 9. Add 3 tablespoons of tomato paste into the mix and stir it well. 10. After around 5 minutes you will see that the paste has made a liquid. At this point at the beef stock. 11. 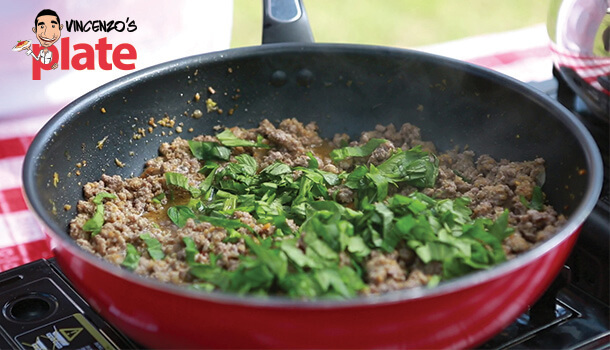 Cover the saucepan with a lid and cook the Spaghetti Bolognese for 3 hours. 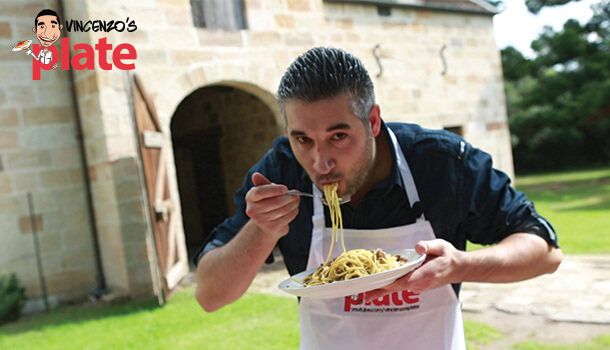 Vincenzo's Plate Tip: You can cook the sauce for a minimum 1½ hr but for best results try to prepare it a little earlier and the Spaghetti Bolognese will be sure to melt in your mouth. 12. Add 5L of water to a large pot and bring it to the boil. 13. Throw in a few pinches of rock salt, mix it through and add your choice of pasta. 14. 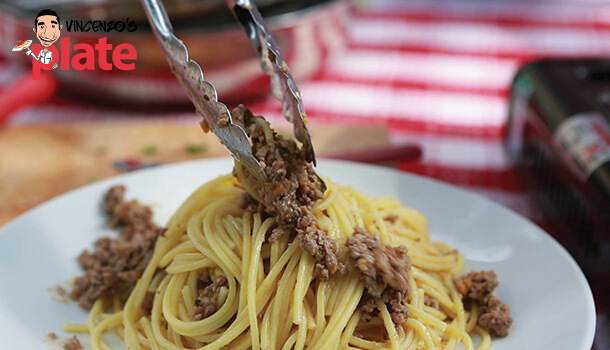 Cook the pasta for your Spaghetti Bolognese dish until it is al dente, and then strain it well and add it to the saucepan of sauce! 15. Mix it together well. 1. Using a large flat white plate, place a twirl of pasta in the centre and make sure some of the rich sauce and meat sits on top. 2. Add some extra sauce using a small spoon. 3. Sprinkle a generous amount of parmesan cheese on top along with a few leftover basil or celery leaves. - Caprese Salad made with buffalo mozzarella, tomatoes, and avocado. - Lemon Tart with a beautiful rich and tasty lemon cream.